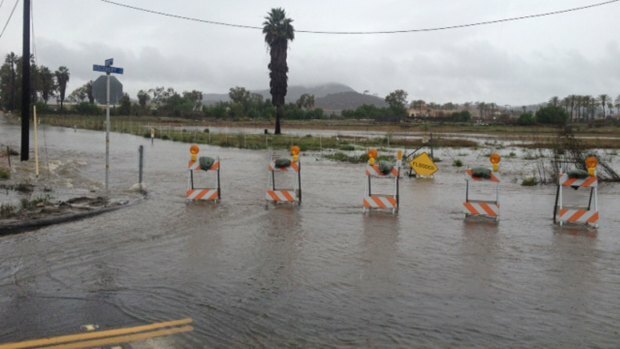 A December storm brought steady rainfall to San Diego County Friday causing some minor flooding and damage but nothing compared to what occurred in other parts of California. A flash flood watch was in effect through late Friday with the possibility of flash flooding in burn areas like that left behind by the Cocos Fire in San Marcos. Deputy City Engineer Matt Little told NBC 7 that San Marcos residents have been preparing for a rain like this for months. They've hunkered down the burn areas with hydro mulch, fiber rolls and silt fences to slow any flow in case of a mudslide. About 50 miles northwest of Los Angeles, heavy rains moved rocks, boulders and mud and piled it up to rooftop levels in Camarillo Springs. 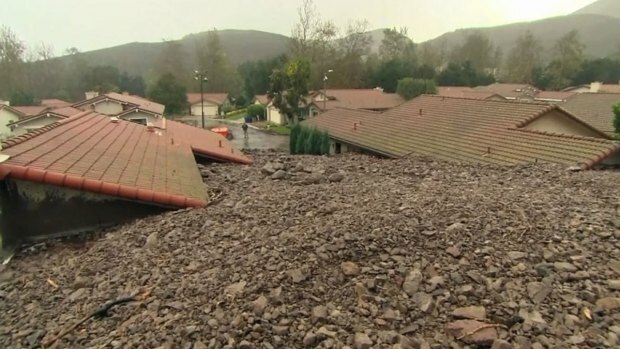 Rocks, mud and debris flowed down a hillside and piled up to rooftop level in Camarillo Springs, a community located approximately 50 miles northwest of Los Angeles. This video shows the damage in the daylight Friday. Friday’s storm brought exactly the kind of rain needed, Little said, steady and quick. If it were a week-long storm, he would be more concerned. It was a different story along the coast, where lifeguards were keeping an eye on the surf. Marine Safety Lieutenant Rich Stropky told NBC 7 the consistent rain and large surf have him concerned about potential flooding. “We do have units out in the field from the Tijuana River Valley to Sorrento Valley prepared to handle any emergencies that may come up,” Stropky said. As of 2 p.m. Friday, waves along San Diego’s coastline reached between 8 and 10 feet, according to NWS. NBC 7's Chris Chan reports from Mission Beach where you can really feel the strong winds and high surf. More than an inch of rain was recorded in Encinitas, Vista, Valley Center, Carlsbad and Oceanside as well as at Lindbergh Field. More than a half an inch of rain fell in Chula Vista, Escondido, Fallbrook, Alpine, Rancho San Diego, Poway, Ramona and La Mesa. Del Mar and National City received just shy of half an inch of rain as of 2 p.m. PT. Minor flooding was reported in Mission Valley along the San Diego River, forcing Fashion Valley mall to close the first level of its back parking garage. 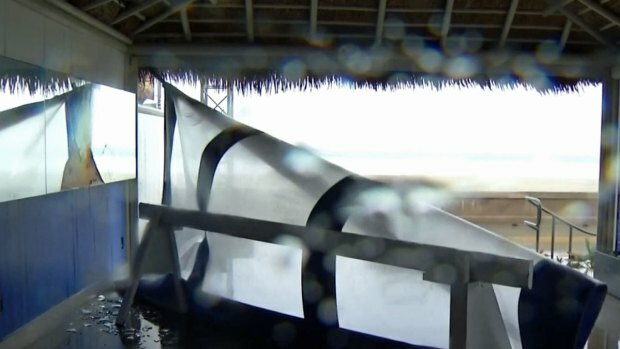 Strong winds that accompanied the rain did some damage along Mission Beach where one business suffered a broken mirror caused by a loose tarp. In Hillcrest, a tall palm tree toppled onto a home at 3rd Avenue and Pennsylvania. When Kenya Patterson with Urban Forestry Tree Department arrived to start working on cleanup, she says she knew it was going to take a lot of effort to clear. “We’re going to be busy probably all night,” Patterson said. The city plans to bring in a crane truck to remove the tree from the roof and cut up the trunk. 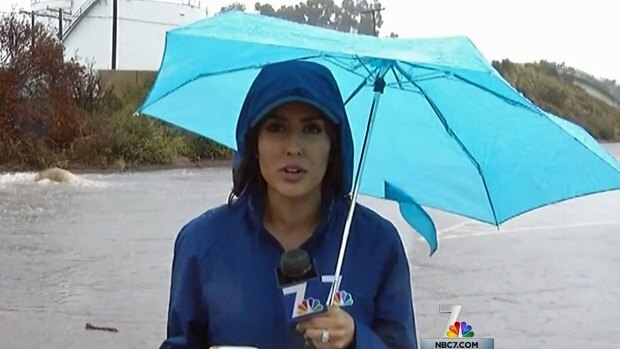 NBC 7's Nicole Gomez reports from Mission Valley where a large amount of water flowed into the parking lot at the Q. In the North County, one trucker couldn’t make the turn at Discovery and Bent Ave because of the flood. He said he’s used to wet roads but complained about other drivers. No one knows how to drive in the rain, he said. For Karen Baskin, who grew up on the East Coast, the rainy conditions on the roads remind her of home. “I love it. 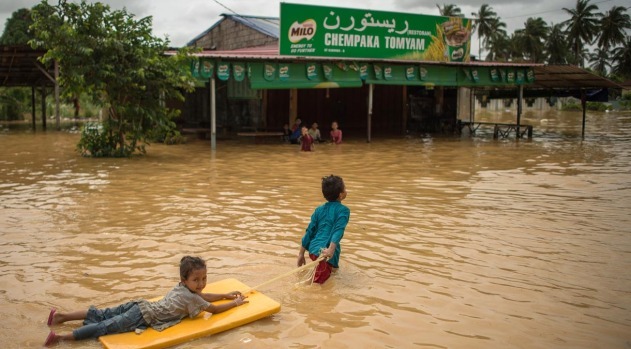 I love driving in it,” Baskin said though she’s careful to use side streets because she feels they are safer in the bad weather. “I think they don’t really understand that they need to adjust to weather,” she said of Southern California drivers. Joanna Pietrzyk is another East Coast transplant who was surprised to hear schools were closed in Northern California due to winds and rain. Slippery roads contributed to a five-car pileup on Interstate 805 southbound near the Sweetwater exit Friday night.